This DVD covers all aspects of successfully inlaying metals like copper, brass, pewter, and aluminum into your woodworking or lathe-turned projects. The techniques are condensed into a highly concentrated and easy to understand format. The idea of metal inlay was born from the need to fill natural voids that don't always look good in finished pieces. 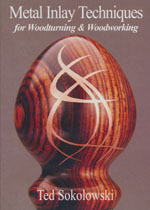 Rather than hiding the imperfection, you can use the void to create a feature for your turning. Ted Sokolowski, reveals his secrets for this technique that has added a signature style to his work and will allow you to expand your designs.